Greetings in the blessed name of our Lord Jesus Christ. First of all, we thank God for His grace and mercy throughout 2012. Indeed, He has been faithful in our lives, and we are so grateful that we can be used as His servants on the mission field. Secondly, our family wants to express the heart of thanksgiving to those who have prayed for us. There are many whom we have never seen, yet we acknowledge the power and the presence of their fervent prayers. Once again, thank you for your prayers and allowing the Lord to continually use you as you co-labor in missions. Well, there were so many blessings we have received this past year. In this letter, we just want to share some of those blessings. Please join us in praise to our Lord. 1. Blessed Furlough – Indeed, God blessed our furlough earlier this year. Thank God for His guidance to various churches and individuals, for His provision throughout that time, and for His protection. 2. The College Ministry – It was a successful year in 2012. The Lord sent just the right number of new students. Praise God for the graduation on December 1, as well as the Alumni Conference in August, which blessed the college and the alumni. 3. Kindergarten Ministry – Mijung celebrated Parents’ Day (pictured right) on November 24. 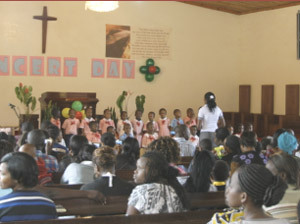 We thank God for a good number of kindergarteners and the faithful service of the teachers. 4. Church Ministry – God is to be praised for a place of worship and for the preaching of His Word. Thank Him for fellowship and the edification of His people. Maasai– The Lord moved Rev. Kim to build a primary school building at the Maasai Kiluani station; Eben has visited the station a number of times to look over the progress of the construction. Although it was not easy to travel to Massai land, the Lord has blessed various opportunities. The building was built beautifully and is waiting for the dedication service to be held on the first week of January, 2013. Rwanda – This project was mentioned in our previous letter, we are praying for the extension of the Bible College in Rwanda. Progress is slow, but we thank God for the opportunity in the central part of Africa. A vehicle– The Lord has provided a new vehicle for our family. Yet when we say “new,” we are not talking about “manufactured in 2012”. Facing various difficulties in transportation to many meetings in Kenya and Tanzania, we have prayed for God’s provision. In September, another Korean missionary went home to be with the Lord. God enabled our family to purchase this vehicle. It is “only” nine years old, and we are so thankful for this provision, especially for long distance journeys. We are praying that the Lord may use this vehicle to be more effective in our mission work. Expenses– Always, as we look back on the year, we cannot calculate how we have come this far. Every corner of our lives, we must confess God’s provision through His people. With that in mind, we want to acknowledge those who sacrificially support us financially. May the Lord bless you. Eben is thankful for God’s grace upon his service. Mijung is feeling much better since her thyroid surgery/recovery, and is noticeably less tired. Haeun is doing great and she has adjusted well to her new school. Hajin just finished his kindergarten education (photo above is his graduation day). Hahyun is always a joy to everyone on the campus. Election– As many of you remember, the country is under tremendous tension during election time. Pray for God’s peace, love and understanding among the various political parties and tribes. Security– At the gate of our college compound, a couple our of students were met by gun-robbers. The month of December has been the most insecure time, especially due to the unstable economy. Pray for security on the road as we travel, as well as on the college compound. BCEA Kenya – The College opens on the 7th of January. Pray for new and returning students, and for all needful preparation for the teachers and staff. BCEA Tanzania: Pray for new students and the new term. Kindergarten: Pray for another successful year. Pray for Eben as he prepares for the new school term in 2013. Also pray as he visits various areas during the term break. 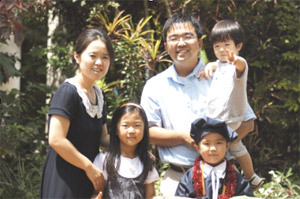 Pray for Mijung as she continues her task as headmistress of the kindergarten and as the mother of three MKs (missionary kids). Pray for MKs. In general, pray for godly wisdom and good health. Haeun– For her improvement in school. Hajin– In order to enter the International School, he has to wait until next August. Pray for a productive time as he prepares. Hahyun– He will enter “Beginners’ Class” next year. Pray for him as he adapts and adjusts. Pray for God’s provision to cover the balance still owed on the vehicle mentioned above. Pray for new couples: Just recently, we were invited to two weddings of BCEA alumni. 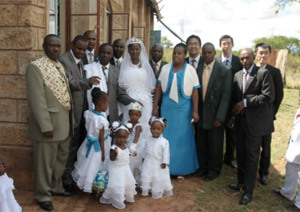 Average weddings in Africa are not the same as it is in Korea or USA. They have different songs, traditions, and procedures. However, holding the covenant before the Lord is always sacred and devout. It was a special experience for Eben to preach for the first time at a wedding, and officiate for the second time. We request your prayers for these couples, especially in their lives as ministers’ family. The first couple was Josphat and Gladys and the second was Patrick and Mary (pictured below). Do remember their families. We are looking forward to see another year come. We are not sure what kind of experiences we will go through in 2013, but we are sure that our Lord will continually expand His kingdom in this part of Africa, so continue with your prayers for our lives and our mission. Once again, thank you for your support in various ways. May the Lord remember and bless your labor in Him. Have a Blessed Christmas and a Happy New Year.